Originally designed for the ceramics industry, the MK-50 from Mosca is now used in the construction sector when equipped with the new 15- or 19-millimeter high-performance sealing unit. 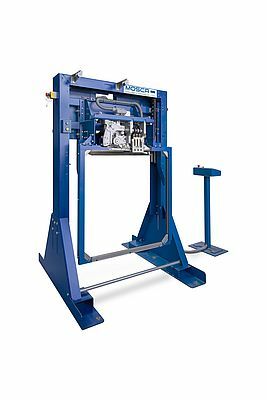 It straps and secures heavy semi-finished products or non-palleted goods thanks to a belt tension of up to 5,000 newtons. The sealing unit allows the MK-50 to handle PET strapping materials with a width of up to 19 millimeters and a thickness up to 1.3 millimeters, and guarantees high tensile strength of the strapping at the sealing point of 80% of the strap used. Moreover, it has an integrated control switch for strapping which ensures that the bundle is successfully strapped. Equipped with upstream and downstream conveyor technology, it is also protected against dirt and high temperatures. The sealing unit is positioned above the strapping frame and is consequently not affected by falling particles.